This full-size French made violin bow for sale, called the Premiere, is quite a unique item! 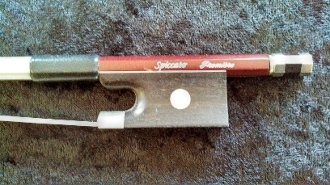 The Premiere Adjustable Camber Violin Bow is a carbon fiber bow made by Rolland's Spiccato, now superceded by JonPaul Bows. This Premiere is one of the rare bows that was made in Paris before mass production began in the United States. The bow is stamped B Rolland, Paris. This particular bow is unusual because not only is it out of production and hard to find, but it is an adjustable camber bow! With this bow, you can make tweaks to the camber of the bow to get just the feeling you want when you play different styles of music. As always, with the carbon fiber, you have extra durability and balance whether you adjust the bow's camber or not. This new Premiere is nickel-mounted and is able to handle many styles of playing. For $3000.00, this bow would work well for a player who would enjoy the ability to adjust the camber of his or her bow.